Pythons have several methods of vomiting their deadly venom on their victims. Pythons target the eyes of the victims and spit their venom. This causes extreme pain and blindness. However, the Nigerian Army has embarked on what could be tagged "venom spit", using this poisonous vaccine to inject Biafran kids and term it FREE VACCINATION. The Medicine administered by the Nigerian Army in Biafra land contains postsynaptic neurotoxins that spread rapidly in a victim's bloodstream, causing respiratory failure and eventually, death. 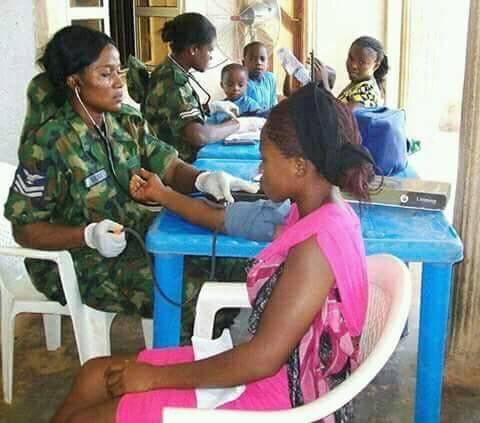 The Nigerian Army, having realized that IPOB is highly at alert to expose all the atrocities perpetrated by the Army have resorted to hide under the disguise of free medical care to eliminate Biafran kids in an effort to de-populate Biafrans. Every nook and cranny of BIafraland is under siege by the army, forcing our children into receiving a poisonous vaccine which slows ones lifespan. This is the reason why "ndi" Anambra must resist any election. Our governors sworn an oath and pledged allegiance to the Northerners that any killing done by the army would be concealed. The questions every right thinking individual should ask are: Why did the Army ignore the IDPs in the North East who need the free medical care urgently and decide to make such offer to those in the South East? Is the vaccine recognized and approved by the World Health Organizations? It is time we begin a revolution in Biafraland else we shall wake up one day only to see an enemy planting in our farmlands. Writes for Family Writers Press.